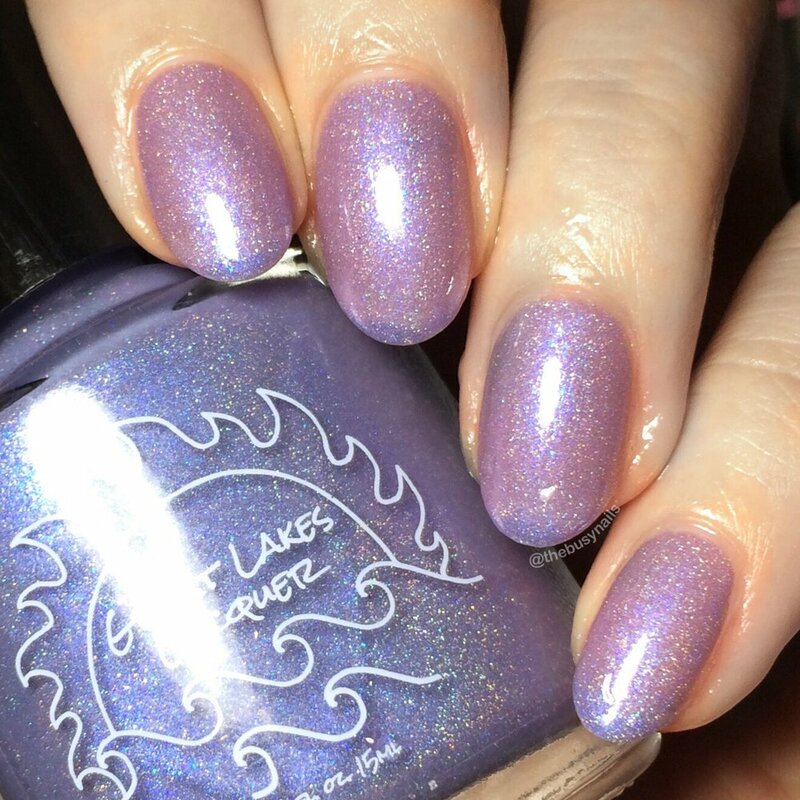 Great Lakes Lacquer is releasing 20 small batch shades for Black Friday, (technically Thanksgiving night), along with lots of other pretty new polishes. Let's take a look! 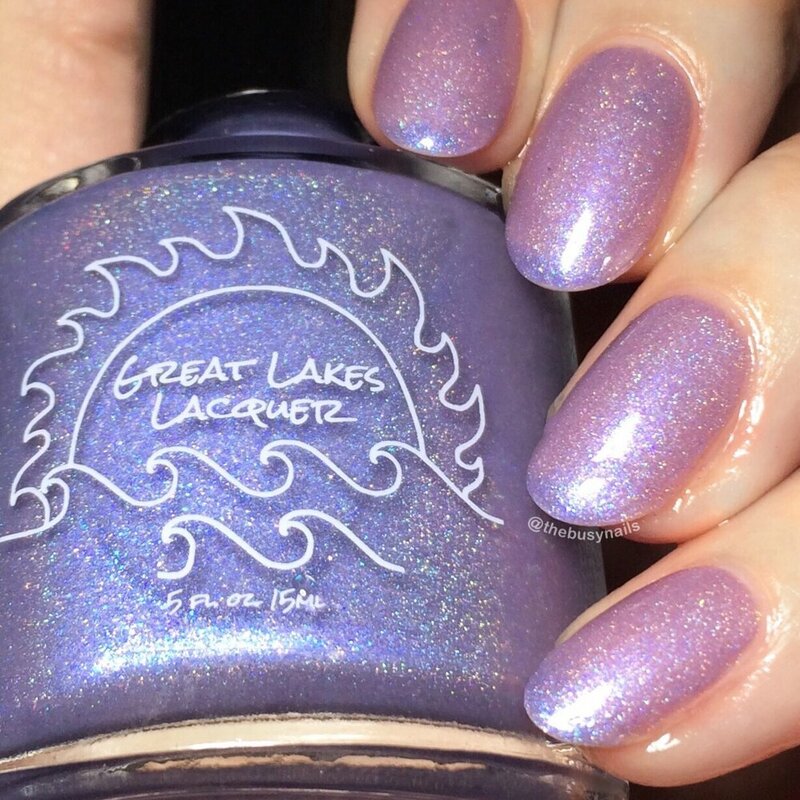 Releasing 11 PM EST on Thanksgiving night (11/23) on the Great Lakes Lacquer website along with the Holiday Collection and other pretty things. Limited quantities. These will be available until they sell out. Mariah (the maker) will combine orders that are placed on Thursday/Friday/Saturday. After that, orders will not be combined. Shipping charges will be refunded if there is an overage. GLL will not honor the free shipping code if it is not used. Grayed out blue to light pink thermal with blue to purple shimmer, a dusting of light gold shimmer, and a soft linear holo finish. This polish! I wish this beauty was more than a small batch so more people could enjoy her, but, alas, she's rare and limited and oh so pretty. My camera didn't want to cooperate with this shade, so you might notice that my skin is extra pale in the cool state shots. I had to edit those to show the true blue-grey color, but they're pretty color accurate now. The pink is the warm state (I'm 99% sure... I didn't actually write down which is which and I swatched these a couple days ago. Sorry!) This is really subtle and ethereal and packed with so much shimmer it can honestly be hard to tell if it's blue/grey/lavender/pink at any given time. I love this color. 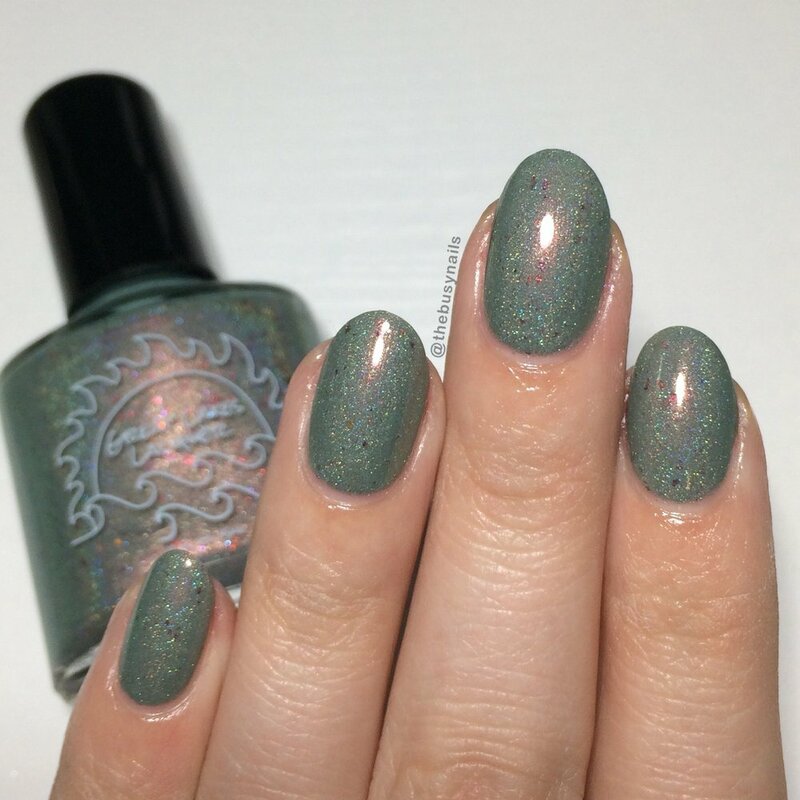 A sage green with multichrome pigment shifting from red to orange to gold and green and a smattering of red to gold multichrome flake that is left with a very soft linear holo flame. So. Appropriately. Named. This is a stunning sage green with an excellent formula. I love the added interest of the small flakies. Not much to say about this beauty that can't be seen from photos. If you love greens in this family, set an alarm for this one. So there you have it! Remember, these are just two of MANY small batches that will release 11 PM EST on Thanksgiving night (11/23) on the Great Lakes Lacquer website along with the Holiday Collection, a gift with purchases over $50, and more. Remember, Small Batches are limited quantities so mark your calendar!